I know he likes birthdays and today was extra special because he got to spend it with Ashley and Eric! Eric and Bob spent most of the day at the Senior PGA tournament. They enjoyed it so much that when they came home to get ready for dinner, they continued to watch it on tv! 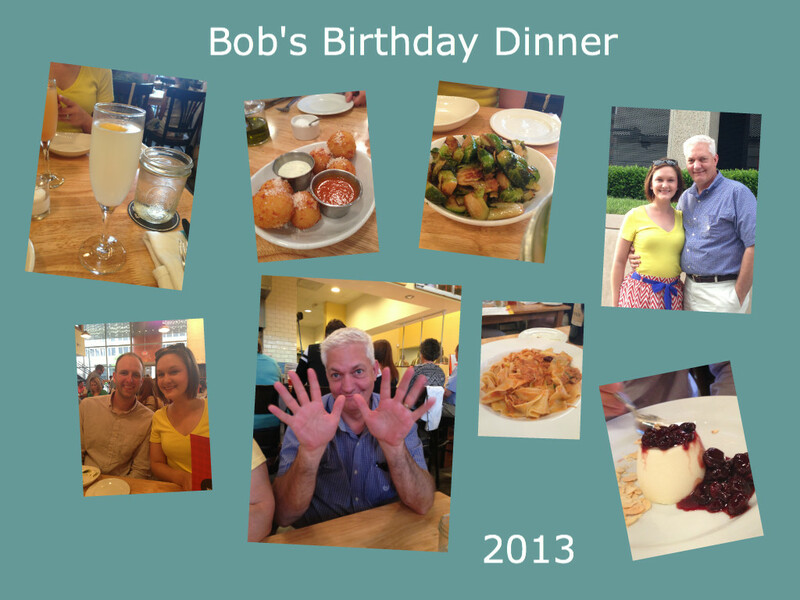 Bob chose to go to Pastria's for dinner, a place we have been to before but that we really love. All of us like going here because the food is good, the atmosphere is friendly, busy and yet homey. Bob ordered risotto ball, roasted brussels sprouts, and crispy potatoes for an appetizer. He got a bottle of wine with Eric while Ashley and I ordered bellinis. Bob ordered the kale salad and we each ordered our meals, roasted chicken for me, Bob ordered pappardelle, Ashley got a ravioli and Eric a lasagne. Our food was fresh, fun, and exciting. We ordered panna cotta and gelato for dessert. While we left feeling very satisfied, we did not feel stuffed. The portion sizes are not huge, although we each left with a small doggie bag. Ashley and Eric gifted him with some special cigars and I gave him a special pan to use on his Green Egg. Happy birthday, Bob! We love you!! 5th Annual Memorial Day Cook Off!